The poem that most haunted me while writing the book is W. B. Yeats’s “Leda and the Swan.” By emphasizing the terror of the event, the brutal indifference and power of the god, he suggested something about the character of the era that unfolded from it. It is with a nod to Yeats’s strange vision of history and his idea that every two thousand years the world’s temperament changes as the result of an encounter between human and divine that I am reflecting on the kinds of encounters happening around us. What counts as the sacred now? What kinds of encounters are we witnessing? And what are those encounters engendering? By offering a multitude of Annunciation possibilities, I wish to unsettle and, to some extent, take leave of the old story, even as I try to find new uses for it. 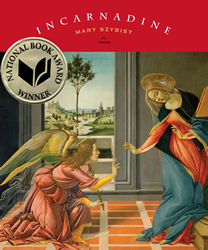 Smart, unflinching, beautiful, the poems in Incarnadine embrace the paradoxes of love: love of being beheld, of being beholden, of being “done unto,” and of what it means to care for what we make of what we are given, or not given, of what it means to “see annunciations everywhere,” in disasters, tragedies, moments of grace and miracle…. In “To Gabriela at the Donkey Sanctuary,” Szybist writes, “It’s not enough to say the heart wants what it wants.” Maybe not. But readers can be grateful to Wright and Szybist (two “solitaries…calling”) for believing that the world, with its hard news, its complicated incarnations, is nonetheless “made of more than all its stupid, stubborn, small refusals.” Among that “more” is the work of these two important and soul-nourishing poets. You can find a recent podcast about Szybist’s “On Wanting to Tell  about a Girl Eating Fish Eyes” here.